Carrying camera kit and sandwiches, I take the M8 and M77 to Pollok, the scheme in the south-west of the city where I lived from 1966 to 1977. If I thought my task of recording the area was hard, I should spare a thought for Timothy Pont and Joan Blaeu, whose 1654 Blaeu Atlas of Scotland features Pollok, or Pook, in the Praefectura Renfroana. Far from the wilderness I had imagined, the map tells me the place was populated, if sparsely. Many of the names – Dormant, Kardonald, Krukstoun, Linthauch – survive on the street signs when, during the mid to late 50s, Glasgow Corporation built badly needed housing stock to accommodate the citizens spilling out of the slums. After Kinning Park, Pollok was idyllic, bucolic even – green space and a house with three bedrooms and a bathroom. When my family moved there we were glad, having lived in a privately rented hovel for years, but for all its obvious advantages, Pollok felt remote, with little by the way of amenities. Like many uprooted families, we tended to stick to our old patch at weekends, returning to the bustling Paisley Road Toll, just as others would return to Victoria Road, Duke Street or Dumbarton Road, depending on which overspill outpost they were consigned to. Part of the motive for this mass exodus was the bars since none of the schemes had any licensed premises thanks to the city’s policy on ‘dry’ wards. For instance, Castlemilk in the south-east with a population on a par with Perth, say, had no pub until the aptly-named Oasis opened in Dougrie Drive (in the early 80s, I think) provoking riots. I recall reading one newspaper report claiming that on its opening night, the Oasis was stripped of its furniture by marauding punters. In the space of a generation, Pollok went from barren backwater to Beirut. Having nothing better to do, youths formed gangs and staked out their territories – the Krew, the Bundy, the Car-D, the Pen – staging pitched battles and generally defiling the area. The housing stock, already jerry-built in the 50s, had deteriorated further. 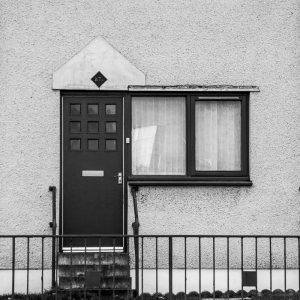 By the 70s, with a sharp rise in unemployment, Pollok, along with all the other schemes – Drumchapel, Easterhouse and Castlemilk – was past its sell-by. In truth, Pollok today is not as conspicuously derelict as it used to be. Parts of it are still grim though – the Brockburn Road – but with demolition of the worst parts, Thatcher’s right-to-buy scheme, the selling-off of land and the arrival of private housing development, on the outside at least, most of the houses look sound and reasonably well-maintained. My first stop is 87A Linthaugh Road. I take a couple of shots and notice a young woman and a toddler emerging from what once was our family home. I’m struck by how quiet the streets are. There are few cars, apart from the occasional family saloon doubling as a private taxi, seemingly a popular route to income in the absence of any real jobs, if you exclude those on offer at the recently opened Silverburn shopping centre, which in its past incarnation boasted the largest Tesco in Scotland, a distinction now belonging to its Port Glasgow store. My purpose isn’t about nostalgia though. On the Google Earth file I discover that one of Harry’s alignments passes straight through number 87 which only reinforces my connection to the idea of lines, invisible tracks. That, and the disquieting feel of the place. Directly opposite our old house, the White Cart Water slips past lazily as ever, a reminder of how not once but twice I almost drowned in its brown murk. The river originates near Eaglesham, close to the De’il’s Plantin, forming another connection in my mind. Meanwhile in Lochar Park, three men open the back of a white transit and wheel out a mini quad bike to indulge their kids. The only other pedestrian is an elderly woman in full make-up, hunched over, lighting a cigarette. Traffic calming in the area means passing drivers can more easily rubberneck as I stand on the pavement with my camera. It’s a short drive to Lyoncross Road, where I get my first glimpse of Crookston Castle, a major site on the Glasgow Network of Aligned Sites. Like Linthaugh Road, the street is eerily quiet. A toy bus waits at its terminus, city-run buses having been scrapped in recent years under deregulation. It’s no longer possible to travel by public transport in Pollok after six in the evening yet there are few cars to be seen, which possibly accounts for the boom in the private taxi trade. Here I’m confronted with the castle itself, apparently the only intact castle in the city. It looms much larger than I remember, standing much higher on its mound. But today, on a sunny Friday afternoon, there is no-one around to see it. Driving up Brockburn Road, I pass what was until recently Crookston Castle Secondary School, an asbestos-riddled building now demolished and where my two brothers and sister were educated. Here I almost run over a man staggering in slow motion across the street. He’s with another man and by the look of them they’re both clearly down on their luck, ravaged by some kind of abuse. Then I notice a third man trying to gain entry to a faceless building which looks suspiciously like a hostel. It strikes me as obscene to have these men, who under normal circumstances would be circulating freely in the city centre, exiled out here on the city’s periphery, away from the gaze of the tourists. The entrance to the castle takes some finding. I see a small road leading off Brockburn, then another, even narrower path leading up a hill to the castle gates and a small house which I take to be occupied by an employee of Historic Scotland, owners of the site. After parking up, I clamber round the back of the castle and relieve myself in the undergrowth overlooking the Levern Water, a small river flowing into the White Cart Water. Undignified as this is, the only public facility is at Silverburn, and I’m not about to go shopping. On the hill I meet a woman walking three dogs. She tells me the caretaker occupying the house is called Susan, but she’s not sure. I look at the house and the two cars parked outside it. Somewhere to the rear there’s the sound of barking dogs. 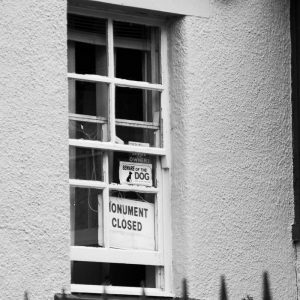 A sign on the window reads ‘Monument closed’ and, no great surprise, ‘Beware of the Dog’. Then, looking closer, I see another sign ‘Beware of the Owners’, a joke surely, but the message doesn’t exactly add up to a welcome. Undeterred, I take my camera and shoot anyway. Downhill, opposite the castle, a row of houses is being demolished. 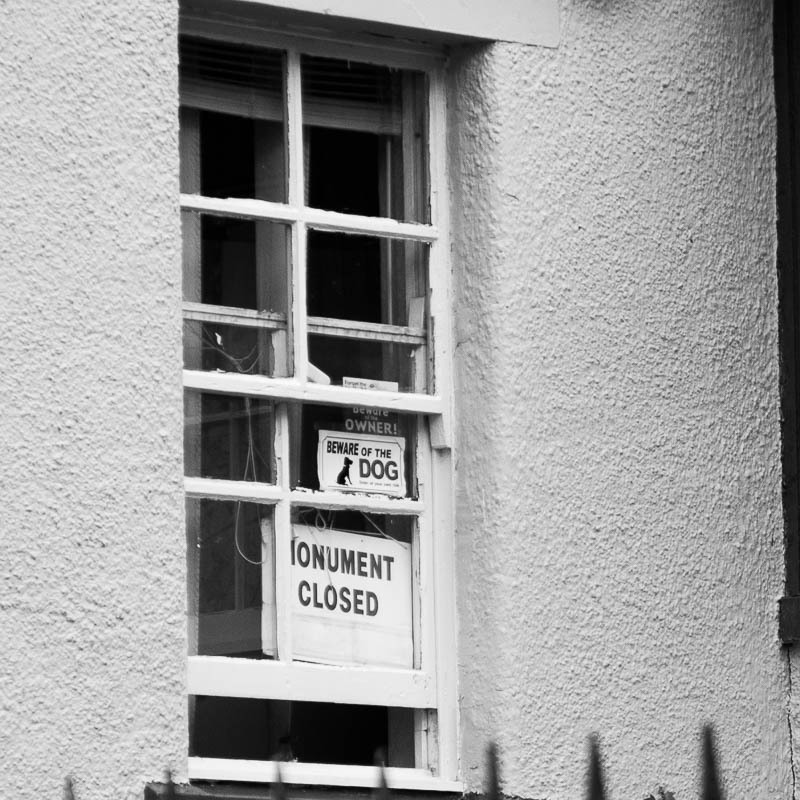 Strange – and sad – how so much effort goes to preserving a building that remains closed to the public for almost half the year, while the people of Pollok are disrupted, unrooted, rehoused, sometimes several times in the space of their short lives. In the months leading up to these field trips, I’ve read various accounts of the castle’s provenance. Crookston Castle takes its name from a Norman baron, Robert de Croe, Croc, or Krok, who in the 12th century built the original castle on the site of an ancient ringwork. A century after de Croc built the castle, a female relative of his – ‘an heiress’ – married into the Stuarts who became lords of the baronies of Crookston, Darnley, Inchinnan, Neilston and Tarbolton. Later, in 1565 Henry, Lord Darnley married Mary, Queen of Scots and according to legend rather than history, courted her under an old yew tree growing on the east side of the castle, a tree later destroyed by souvenir stealers until it was removed in 1817 by Sir John Maxwell. One account claims the wood from the tree was carved into a model of the castle and kept at Pollok House, seat of the Maxwells. Mary didn’t, as some accounts suggest, witness the Battle of Langside from Crookston. Her marriage to the “low life, drunken, arrogant and shallow” Darnley was short-lived, after he was murdered in an explosion at Kirk o’ Fields near Edinburgh in 1567. His estate was passed to Charles Stuart, second son of the Earl of Lennox, then to Robert Stuart, Bishop of Caithness. After changing hands over the years, in 1757 the lands were bought by Sir John Maxwell whose son, also John, who refurbished what was, by the nineteenth century, a derelict pile. For all Crookston’s colourful past I can’t help but think I’m standing in front of a fake, a fib in stone. No ‘experience’ for me today, the gate’s firmly locked and wurse, there’s a coupla dugs anaw. Promising myself a return visit (next time I’ll phone the keepers and see how lucky I get) instead I turn my camera on the houses being demolished at the base of the hill because if nothing else I know next time they’ll be gone. The castle isn’t going anywhere. A very interesting visit and photos. I live above your old home. The atmosphere in this building is one of welcome with good vibes. Yes the place is quite, and thankfully the morons that populated the gangs seem to have grown up, there’s very little vandalism (although some idiots still can’t leave anything undamaged). I’m interested in what you mean by “Harry’s Alignments” means? And how it passes through the house? I saw you across the road taking photos and wondered what it was for… Now I know. If you come past again you will instantly notice the dog and cat home across the river has more than doubled in size and so has the noise level. The idiotic architect has designed a perfect working amphitheater pointed directly across the river, it get so bad you cannot hold a conversation outside the house. Hopefully there may be something done eventually to reduce the noise level. It’s a small world. Our family moved to number 87 in November 1966 – we lived on the second floor. After growing up in a room and kitchen it seemed luxurious – a four apartment with a bathroom and kitchen – though in truth it was jerry-built and freezing – one coal fire and paraffin heaters. I left in 77 when my parents kicked me out. By then I was at the Glasgow School of Art and had outgrown the bedroom I shared with my older sister. 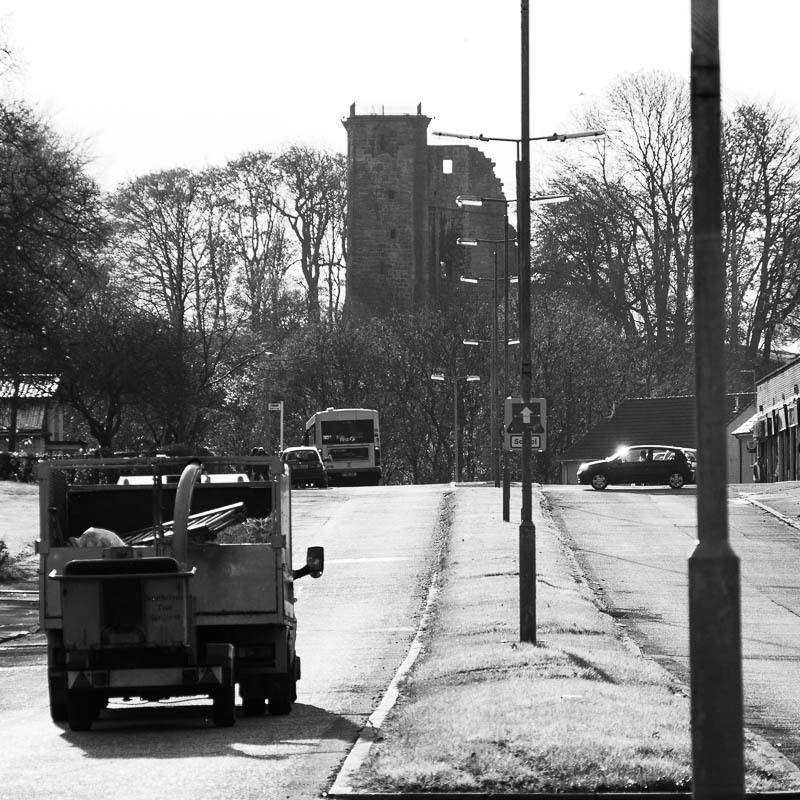 When I returned to Pollok for my project I was struck by how quiet the place seems. I’m quite amazed you spotted me taking pictures – if it was me you saw – I shot stuff there in 2008-09. It didn’t take long to notice the noise from the Dog and Cat home – when I was growing up we got used to the nonstop barking but it seemed louder. You ought to take it up with the council and your MSP. As for Harry’s alignments – try this link. Thanks Steven, for taking the time to comment. I agree that more investment’s needed – not just in Pollok, but in all the schemes and as you say, it’s unlikely to happen in the midst of the current recession. in reply to may miles thomas. dylan was very young when he wrote that comment 4 years ago, so go easy on him with the spelling. he’s my cousin. my family live in 83 linthaugh road. I was very interested in your article. I attended Crookston Castle school leaving in ’59. The school holds many happy memories for me and I often wonder what happened to my class mates. Thanks for writing, James, and your interest in my work. The project is to create a website using video footage/animation, text and specially composed sound. My main inspiration for the project is a book called ‘Glasgow’s Secret Geometry’, written by Harry Bell in 1984, who had a theory that Glasgow is laid out in a pattern determined by ancient sites and tracks. Having grown up in Pollok, I was surprised to learn that one of Harry’s alignments passed straight through my childhood home in Linthaugh Road. 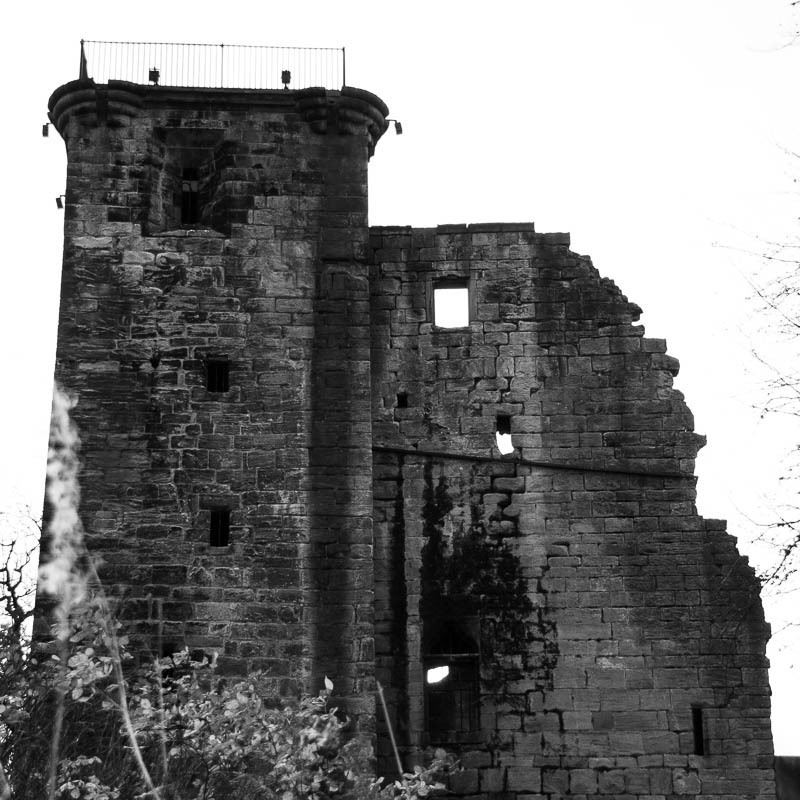 It turns out that Crookston Castle is one of four major sites, the others being Camphill Earthwork in Queen’s Park, The Necropolis and the Devil’s Plantation, or De’il’s Plantin, a mound situated between Newton Mearns and Eaglesham. For the last 18 months or so, I’ve shot footage of virtually all of Harry’s sites. Over the next couple of months, I plan to bring all this work together, laying out Glasgow’s Secret Geometry and the story behind it, with links to short videos that show what the sites look like today. It’s been a fascinating journey for me so far and hopefully one that other people will find interesting. I hope that answers your question and please keep in touch! I’m a former Polok resident and attended Crookston Castle School. What is your project on “aligned sites”? I would interested in hearing more about it. For a long time I wondered if I should publish your comment. Why? Because I didn’t want to embarrass you because your spelling’s terrible. Pitcher = picture, permishon = permission. I’ve now changed the photograph to show only the house where my mum and dad – Mr and Mrs Eakin – lived. You might have known them. 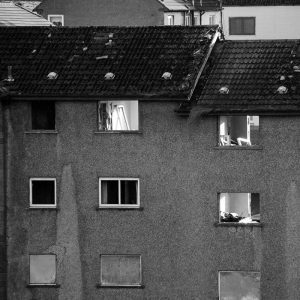 We used to live in the flat upstairs before the building was converted. We moved to Pollok in 1966. I lived there until 1977 after I fought with my sister and got kicked out.